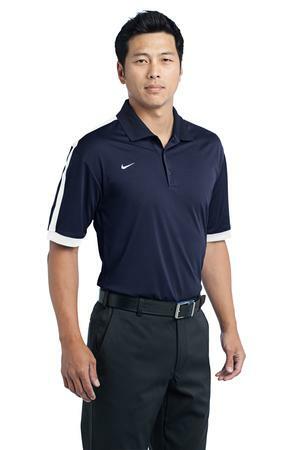 The Nike Golf Dri-FIT N98 Polo Style 474237 is available in Adult Sizes: XS-4XL and comes in Navy/White, Black/Cool Grey, Black/Varsity Red and Signal Blue/Black. Undeniable style and performance in a true classic: the N98. With contrast striping along the shoulders and sleeves—and Dri-FIT moisture management technology—this modern polo is course-ready. Design details include a flat knit collar, three-button placket and open hem sleeves. The contrast Swoosh design trademark is embroidered on the right chest. Made of 5-ounce, 100% polyester Dri-FIT fabric. Be the first to review “Nike Golf Dri-FIT N98 Polo Style 474237” Click here to cancel reply.